In her teaching Sally seeks to find a balance between dynamic standing poses, energising backbends and twists, calming forward bends and resting postures. No straining or struggling to achieve a pose, but rather working with the breath to find right effort (not too much, not too little). She has spent the past year revisiting Iyengar Yoga and brings the energy of this practice and precision of alignment to her classes. 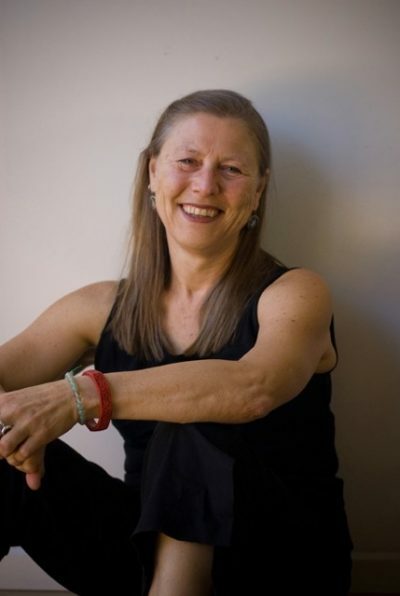 As a student of the Alexander Technique for many years Sally’s yoga practice, while strong, is always informed by mindfulness and body awareness. Yoga with meditation and pranayama. I would say that you are one of the most inspirational yoga teachers I have met. I enjoy your consistency and authenticity in the weekly classes that I have attended since 2009. Every time I visit Harvest Yoga studio, I leave with improved spirits, more tranquility and peace. It is impressive that since I have known Harvest Yoga, the studio changes and persistently finds ways to be a relevant and meaningful space to practice. Attending Harvest Yoga has enabled me to cope so much better with anxiety. Practising with Rick has enabled me to meet so many other challenges. I can come to a class feeling very dizzy or uneasy. I can honestly say that attending classes is my salvation. The somatic exercises, meditation and the more challenging poses leave me feeling so much more hopeful and empowered and there is always a laugh or two which is the essence of life I think! I have been going to Rick’s class for roughly 7 years and I never tire of it or of him. He is a teacher who continues to discover, educate and enlighten. He is funny but makes you work and encourages you to advance your practice not only through meditation but through ever changing poses and sequences. In his class he inspires a deeper appreciation of yoga and what it can do for you. Most of all I love Rick’s class simply because of the effects it has over the following week, thus I keep going back! I started coming to Harvest Yoga in 2012 after a personally challenging time. I had tried Yoga a couple of times previously, but could never connect. When I arrived at Harvest Yoga I knew I had found the right place. The organic calming vibe of your studio in Kensington speaks volumes, it is an oasis for body and soul to recharge from the crazy demands of our busy lives. Over the years, your classes have definitely helped to address problem areas in my body – the hamstrings, the crooked hips, the tight shoulders and sore neck – and my soul. I can’t thank you enough for that! I have done a lot of yoga classes over the years and have a clear feeling of what works for me. These classes are about yoga – in its fuller sense – not just some physical exercise but the practice of bringing mindfulness to movement. The studio is a treat in itself. What can I say – it smells good, looks good, feels good and is the perfect environment for an early morning class. I’ve always loved how you so easily moderate the poses especially when I’ve needed a challenge or to pull back due to an injury. The biggest thing I’ve always taken from your class is the notion to be playful with a pose – to find yourself in a pose through breathing and exploring it and to have a renewed sense of awareness for the practice whilst keep the integrity of the pose/movement. Harvest Yoga is a haven. A beautiful and restful studio in all seasons. I like to watch the trees or a sunset through the windows onto Epsom Rd. I like to see the sky and hear the magpies carolling when the doors are open on a summer’s evening. Firstly, thank you Belinda and Harvest Yoga for having a mums and bubs yoga class available. Best thing ever!!!! The twins and I loved coming to the class to connect with other mums and babies. I really enjoyed learning how to incorporate baby massage and baby yoga into our daily interactions. The twins loved coming and Edward enjoyed being the “demonstrator”. Even if I was having a crazy day at home you offer a beautiful calm and peaceful space that just helped me to relax. Belinda is a fantastic teacher with so much experience being a mum herself it was very reassuring during those times that my babies were unsettled and I felt very supported and cared for.